You are here: Home / Blog Entries / EMT Training: How Do I Become an EMT? It’s great that you’ve made the decision to become an EMT, but now, the hard work begins. And unfortunately, the answers to often-asked questions aren’t always easy to come by. How exactly do I become an EMT, anyway? How do I figure out what school to apply to, or what prerequisites programs have? Is there a minimum age requirement? Are there certain certifications that are mandatory? The truth is that every single school (and every single state) has their own list of criteria that they’re looking for in a student. Therefore, the application process can vary from program to program. With that said, there are some standard requirements that are currently in place. In this article, we’ll discuss these prerequisites in hopes of demystifying the EMT training process, which we know can seem a bit convoluted. First, let’s start with the basics. While every program can be slightly different, usually, you must be 18 years old to apply to an EMT program. While you are required to be 18, you are not required to hold a college degree. One of the great things about becoming an EMT is that the career of an Emergency Medical Technician doesn’t require a lot of education or experience. While some jobs in general may require you to hold multiple degrees, when you apply to an EMT training program, you only need to hold a high school diploma or GED. With that said, you will also need to hold a valid drivers license. And with the basic EMT job description requiring EMTs to perform CPR on patients unable to breathe on their own, you’ll also need to hold CPR certification at the Healthcare provider level. Those applying to EMT schools will need to be able to read at a 10th grade level or higher, as well. Some programs, in their attempt to make sure their students meet their standards, will be asked to take certain assessment tests (such as COMPASS, for example). It’s also important to note that as an EMT, you will constantly be in contact with a variety of patients—both in the field and inside of hospitals or other medical facilities. That means that you’re expected to be in good health. To prove that, you’ll likely be asked to provide a record of a recent physical examination. Coupled with the physical, you’ll need to provide proof that you’ve received multiple immunizations. The list of required vaccinations may vary to a degree, but will likely include proof of a recent Tuberculosis immunization, as well as Hepatitis and Measles, Mumps and Rubella. Once you’re accepted into an EMT program, you can expect to receive approximately 100 hours of specialized training. While training is often done in the classroom, you may also get your education in the field (on an ambulance, for example) or in clinical settings (inside a hospital or medical facility). In comparison, while EMT training can last about 100 hours, those interested in becoming a paramedic can expect to receive 1,300 hours of training. 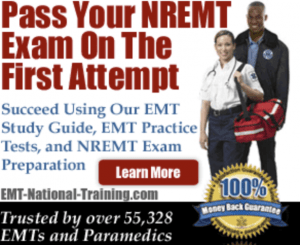 Once you graduate from your EMT course (which will take anywhere from 3-6 months on average), you’ll likely want to take the NREMT examinations. The NREMT certifies EMT and paramedics on a national level. While having national certification alone doesn’t qualify one to actually work in the state of their choice, the goal of the NREMT is to make sure that all EMS personnel responsible for treating patients are competent to work. The NREMT exams consist of a computer adaptive test and a skills test. Once you pass these exams, (and are ready to work as an EMT), you’ll then need to apply for a state EMT license. To acquire a state license, you’ll need to apply to the EMS agency in your region. The application process can often be as easy as submitting some required paperwork to the agency for review, or as complex as taking a mandatory state examination to obtain your license. Once both your EMT certification and state license have been acquired, you’re then able to search for employment and ultimately get hired as an EMT.